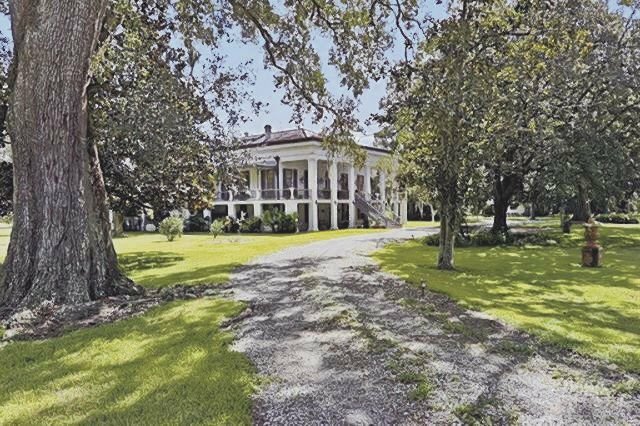 What a dream this would be: to own and live in your very own plantation home surrounded by acres of trees, greenery – and even a barn for horses. As you enjoy morning coffee on your veranda, you watch the lazy Bayou Lafourche drift by. This listing could be the realization of that dream. The West Indies-style plantation house itself is magnificent with a wide brick walkway leading up to massive stairs guarded by two lions. There are ten wide porches, some covered, some open to the air and the porches alone could be enough space for weddings or other parties. The front door leads into a massive hallway with an archway and it’s easy to imagine a bride using it as an aisle up to her groom. The refinished floors throughout the plantation are gorgeous and add a distinctive patina to the house. The plantation has large double parlors with plenty of space for seating and entertaining. They also have fireplaces and chandeliers, pocket doors and triple-crown moldings. The dining room is massive enough to hold sit-down dinners for a dozen family and friends. The kitchen is a study in wood and stainless steel. There are wooden cabinets affording plenty of storage, an island for seating and all stainless steel appliances. Baths have plenty of marble and mosaic tiles in the shower. There’s also room in them for some pieces of antique furniture. Donaldsonville is a small city and the parish seat of Ascension Parish, along the River Road of the west bank of the Mississippi River. 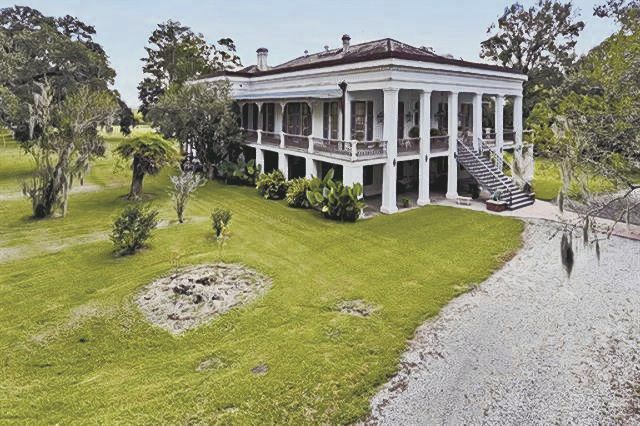 The Historic District has what has been described as the finest collection of buildings from the antebellum era to 1933, of any of the Louisiana river towns above New Orleans. Various cultures of indigenous peoples lived along the Mississippi River for thousands of years prior to European colonization. The Houma and Chitimacha peoples lived in the area. Descendants of both tribes were federally recognized as organized groups in the 20th century and they each have reservations in Louisiana. The French were the first Europeans to colonize the area. They named the site Lafourche-des-Chitimachas, after the regional indigenous people and the local bayou, which they gave the same name. They developed agriculture in the parish, mainly as sugar cane plantations. Acadians, expelled by the British from Acadia in 1755, began to settle in the area from 1756 to 1785, where they developed small subsistence farms. Spanish Isleños also settled here. In 1772 when the territory was under Spanish rule, the militia constructed La Iglesia de la Ascensión de Nuestro Señor Jesucristo de Lafourche de los Chetimaches (the Ascension of Our Lord Catholic Church of Lafourche of the Chitimaches) to serve the area. This area was included in the Louisiana Purchase in 1803 and became part of the United States. Landowner and planter William Donaldson in 1806 commissioned the architect and planner, Barthelemy Lafon, to plan a new town at this site. It was renamed Donaldsonville after him. Donaldsonville was designated as the Louisiana capital (1829–1831), as the result of conflict between the increasing number of Anglo-Americans, who deemed New Orleans "too noisy" and wanted to move the capital closer to their centers of population farther north in the state, and French Creoles, who wanted to keep the capital in a historically-French area. The wealthy planters built fine mansions in the town during the antebellum years.